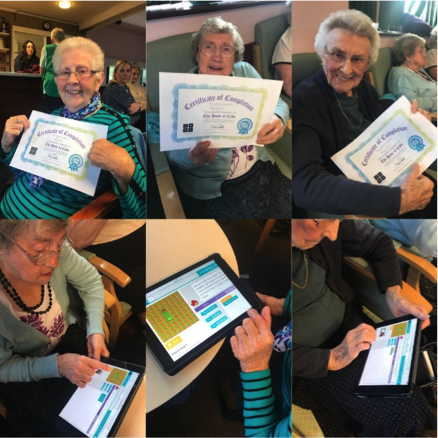 In November 2017, Leeds Library and Information Service trialled a series of Hour of Code workshops with Over 60s in partnership with South Leeds Live at Home. The main objective of the sessions was to use digital technology to promote the health benefits that mind-stimulating activities have on older people. Our coding activities for children and families are extremely successful, and we thought similar activities would be popular with this new audience. When we approached the groups of Over 60s, the first question we were asked was: Why would Over 60s want to learn how to code? The groups were adamant they were not looking for a career break into software developing any time soon! To answer the question, we talked about the benefits of coding rather than the activity itself. Coding can keep your brain sharp: According to a recent study, engaging in problem solving activities can help to protect an ageing brain. Coding challenges the brain and the act of learning to code will strengthen your mental faculties. Coding can help to relieve stress: We need to find ways to turn off the noises in our heads and relax; when you’re coding, you shut the world out and concentrate on the task in front of you. Coding can keep you social: Coding is more fun when you’re doing it with someone else; helping each other and problem solving together can be a lot more fun. It’s interesting to see which challenges you face and which ones others face - teamwork makes the dream work! Similar to crosswords and puzzles, a code a day can keep your brain 10 years younger! After hearing more about the benefits of coding, there was interest and curiosity from the group and we all decided to have a go! Our workshops covered an introduction to coding, avoided any unnecessary jargon, and provided examples of coding the audience could relate to. The activity provided lots of laughs along with the learning; the sound effects and Angry Bird characters really amused the group! We provided handouts throughout the workshops to support with new commands and explained each level in more detail. We ran the sessions very collaboratively, giving the group opportunities to support each other to complete the levels, developing teamwork and communication skills. Refreshments were provided with tea, coffee and biscuits which all of the group members said helped their minds work! 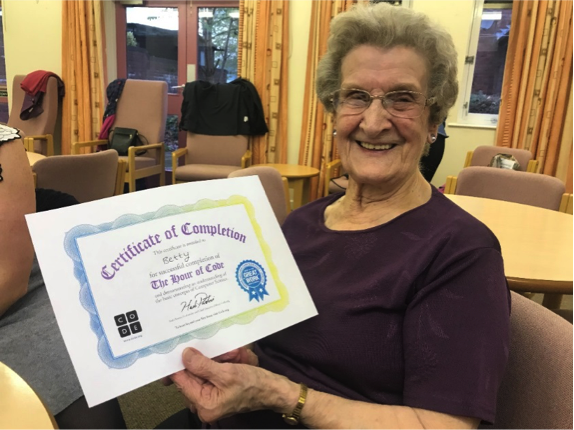 The Hour of Code certificates were VERY popular with the groups, and their sense of achievement was enhanced because they had a certificate to show to friends and family members. After the fantastic feedback from the group members on the initial workshops, we’re going to be setting up further coding sessions for over 60s. Where group members faced accessibility issues in visiting their local libraries, we have delivered sessions in community venues so that more people can take part. All of the ladies who completed the Hour of Code have either framed their certificates or put them in positions of pride on their walls. 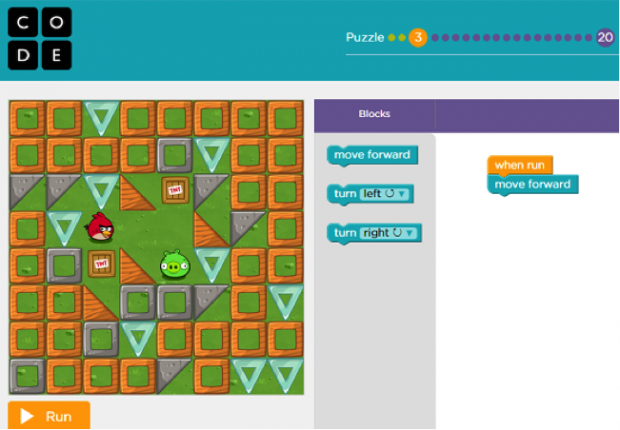 They have felt a real sense of achievement in telling others about their coding experience. It has been a brilliant success story and this is just the start. 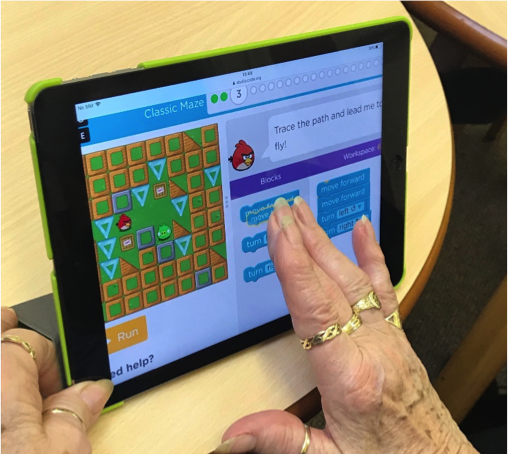 We are exploring new activities to develop coding skills and confidence for the over 60s – watch this space! Leeds Libraries have always helped people to be creative, discover new ideas and learn new skills. These workshops have enabled us to attract new audiences to our digital offer and have encouraged us to expand our research into coding and the benefits it has for people of all ages. 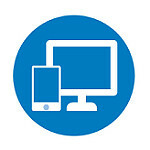 Keep up to date with activities run by Leeds Libraries by following them on Twitter.